The phase switch ensures that both signals at the mix are in phase with each other. Some circuits invert the phase and others do not. No matter what you decide to connect to the Paramix this is never an issue. If the effect is a delay or echo, you can use the “Kill Switch” feature to cut off the signal to the delay or echo and still preserve the “tails”or “repeats”at the mix stage. 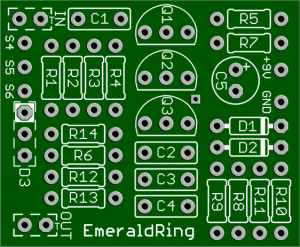 It allows you to decide exactly how much wet and dry signal you want. Not just blending in a Dry or Wet Signal Ratio. This is a great way to Mix full-blown distortion with the gritty attack of your dry sound for added clarity. Use modulation pedals simultaneously without them affecting each other in a negative manner.Or, just inject a little shimmer to your tone by adding in just the right amount of chorus or phase. Standard usage is to mix any percentage of effect with the dry signal. 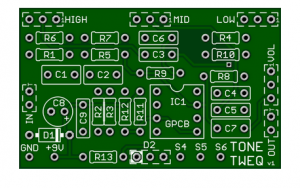 The Paramix Effects Loop by GuitarPCB: A Swiss Army Knife style tool incorporating many benefits including the ability for “True Mixing” and not just simple Blending. The phase switch ensures that both signals at the mix are in phase with each other. Some circuits invert the phase and others do not. No matter what you decide to connect to the Paramix this is never an issue. If the effect is a delay or echo, you can use the “Kill Switch” feature to cut off the signal to the delay or echo and still preserve the “tails”or “repeats”at the mix stage. 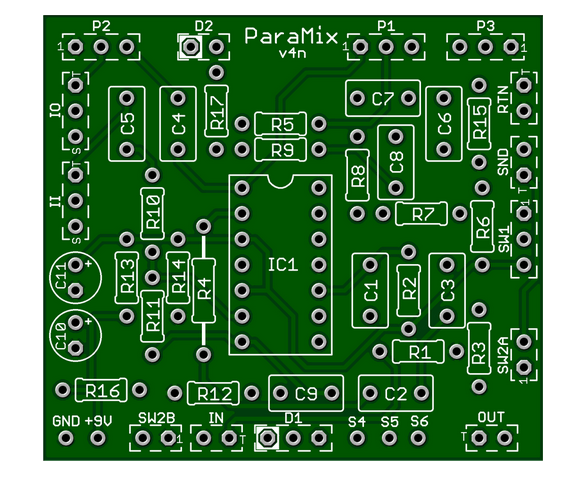 Another feature of the ParaMix is the Insert jacks in the dry signal path. With nothing plugged into the IO (Insert Out) and II (Insert In) jacks, the dry signal passes directly to the mixing stage, IC1B. When an effects pedal is plugged into the IO and II jacks the dry signal passes through the effect before reaching the mixing stage. The correct type of jack must be used, these are mono jacks with a contact switch. Probably my favorite is to use a delay and fuzz/distortion in the loop. This will thicken the sound. Bass Players can use this with any DIY or Commercial Pedal and not have to worry about Modding it for Bass! Mix in as much Dry Tone as needed for Bottom end and Rock out with the bass on any pedal you like!